Please disregard the long period of absence. I’ve been quite busy with work and couldn’t find the time to write about the kits that I bought and finished. Now that I have the chance to write again, I’d like to discuss (starting with this post) all the projects that I did during the quiet period according to which ones were completed first. 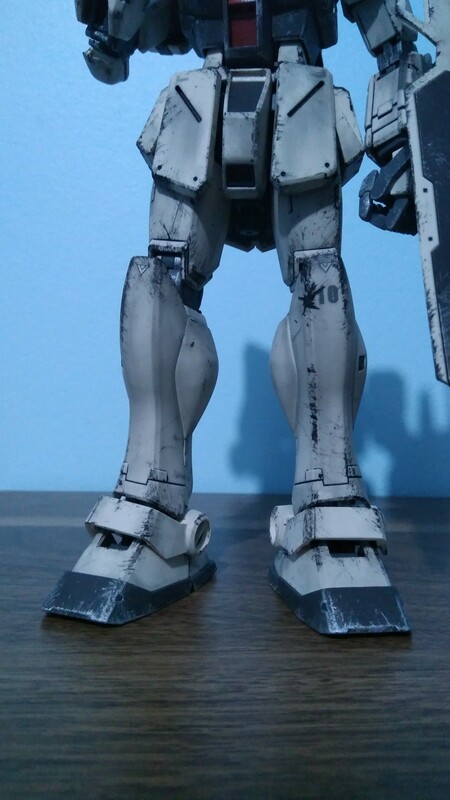 Instead of another build summary, this post will discuss my first ever weathering project. I once swore to never delve into weathering because I couldn’t see why I should intentionally gunk up and damage a kit I worked so hard on. 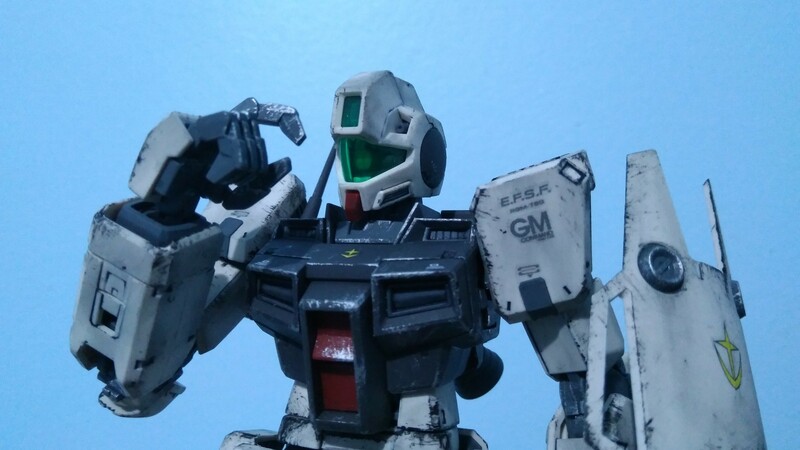 It was only was after I finished assembly and minor detailing for the GM Command that I realized how bare the mobile suit looked even with all the decals I applied. The first thing I did was get the tools ready. Before applying any paint on the kit, I tried to see how they would look on the actual armor parts using the kit runners that I still had lying around. 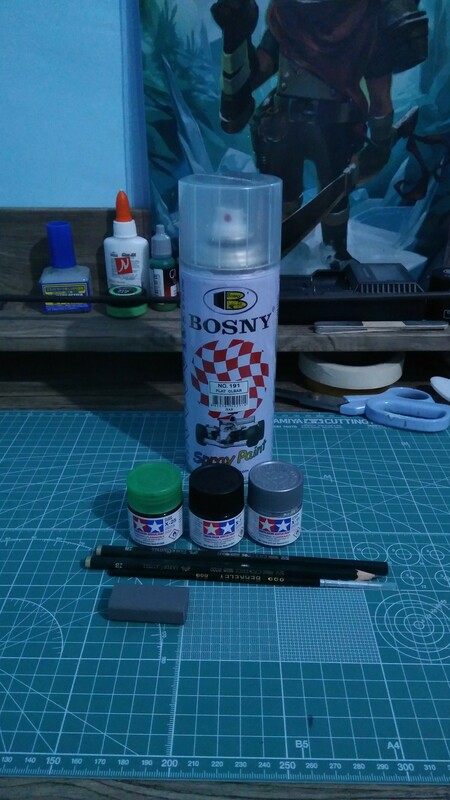 This helped make sure that I got the desired color and effect on the particular armor or inner frame piece that I was working on. The only paint application method I used for this project was dry brushing. Here’s where I encountered a problem. The Chrome Silver worked really well, but the Black just didn’t want to adhere to the plastic. I got it working to some degree after a bit of thinning but still wasn’t able to make it work as well as the silver. I’ll have to get myself a better thinner solution or use a different paint:thinner ratio for the next painting project. 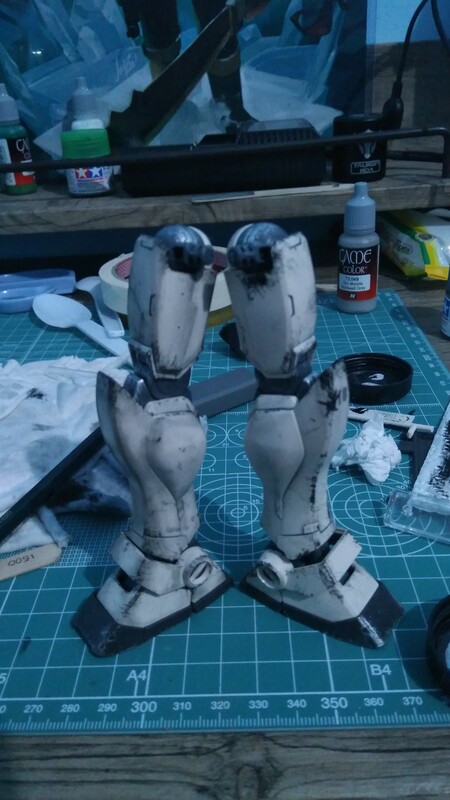 After the runner tests, I started dry brushing armor pieces starting with the feet and legs. 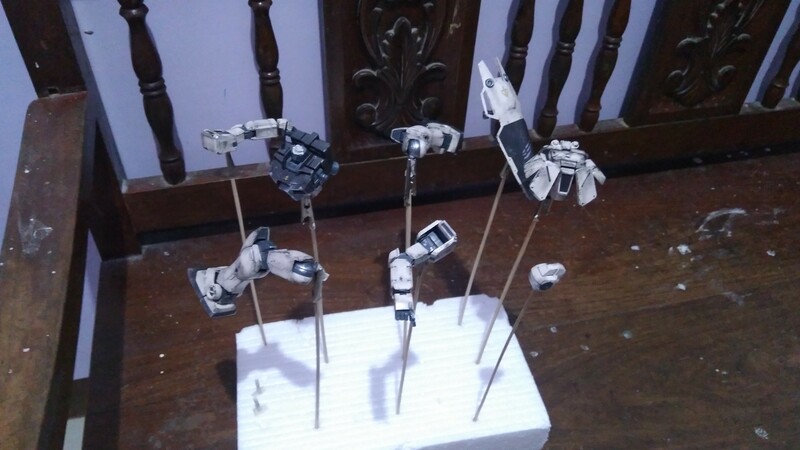 The painting was done on semi-assembled limbs and parts because I couldn’t be arsed to do a full disassembly. 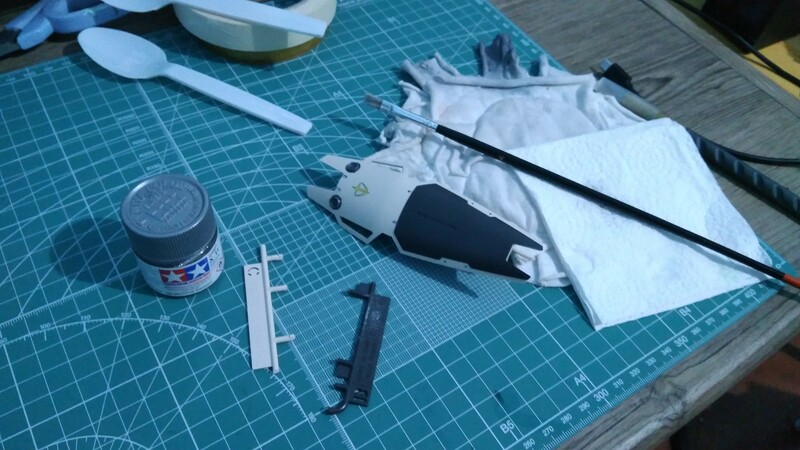 This means that I wasn’t able to reach unexposed parts of the inner frame. I don’t just let somebody disassemble my kits though, so I didn’t really think it was that much of a problem. Rugged feetsies. Check out the unpainted thrusters tho. The next step I did (which I admit should’ve made more sense as the first application) was apply a bit of shading and oil or grease stains by using ground pencil lead. I managed to get quite a bit of powder by shaving off the exposed lead with a hobby knife. I made sure to keep all the gathered graphite in caps I had lying around to keep it from messing up my work station. 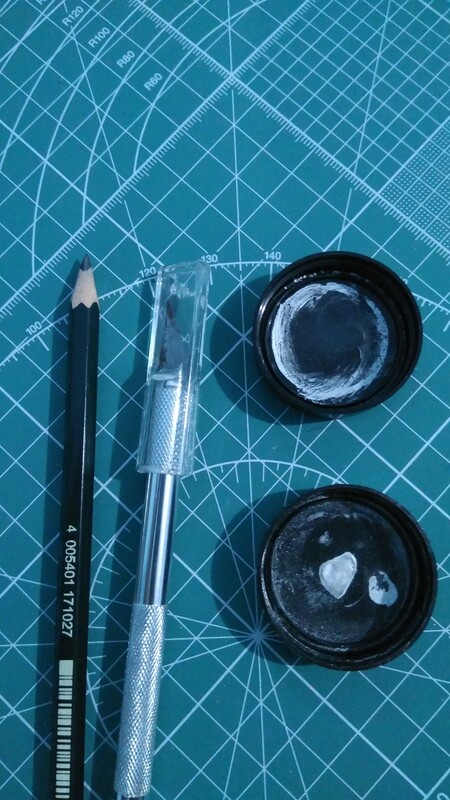 I would recommend getting a small smooth surface palette instead (which I didn’t have at the time) because some of the powder got stuck in the cap threads. For grease smears, I applied a liberal amount of graphite on an edge and brushed downwards with a cotton swab then very lightly wiped the marks with some damp tissue. There were a few nub marks on the forearm that I wasn’t able to fully get rid of so I made it look that they were weld marks instead. 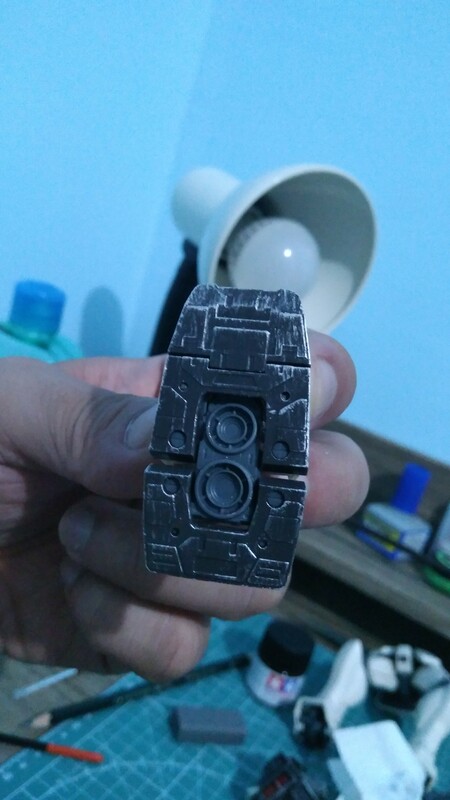 Whenever I wasn’t satisfied with an effect, I used a bit of alcohol to remove the paint and graphite with some help from an eraser for some of the thicker applications. The final step was applying a clear coat to all the parts. I now realize that I didn’t take a lot of pictures during the painting and shading phase. Maybe I was having too much fun going crazy with the paintbrush. The coat was applied on a sunny morning at around 8:00 am to avoid any silvering. I also had to take into account the possibility of stray dust particles getting stuck on the plastic so I had to choose an outdoor painting spot without too much wind. 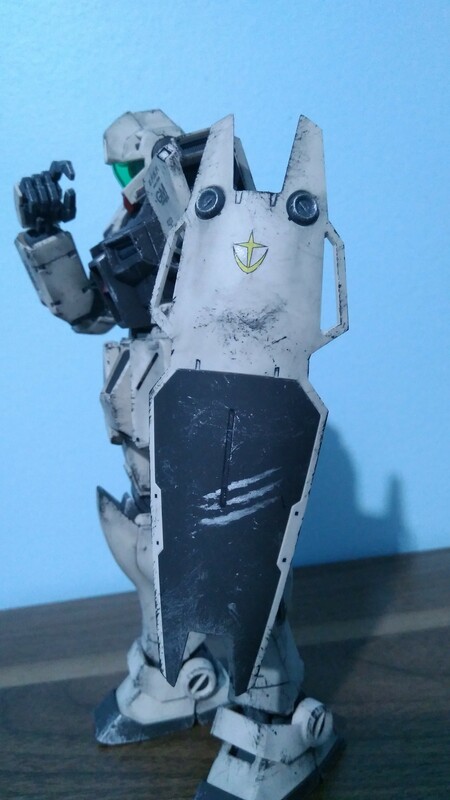 Over the course of this project I managed to ruin two decals, one cheap paintbrush and a hobby knife blade. I also managed to permanently stain my cutting mat which was the careless mistake that hurt me the most. I learned that I should thin my paints better and to not freaking go overboard next time unless the intent was to make something akin to a severely neglected cargo truck. The project took me around a week to finish at about two to three hours a night. Maybe this GM tangled with a Zee Zulu, idunno. Oh man. This dude does a LOT of power slides. Football player mabye? Backside. 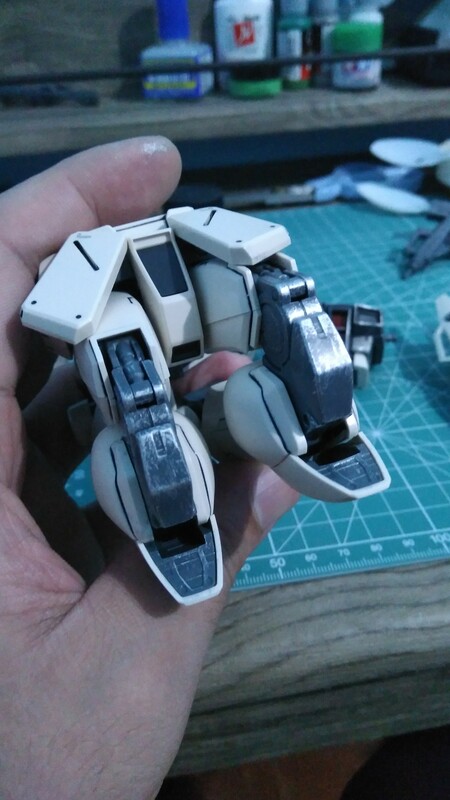 I really like the GM leg and feet design. 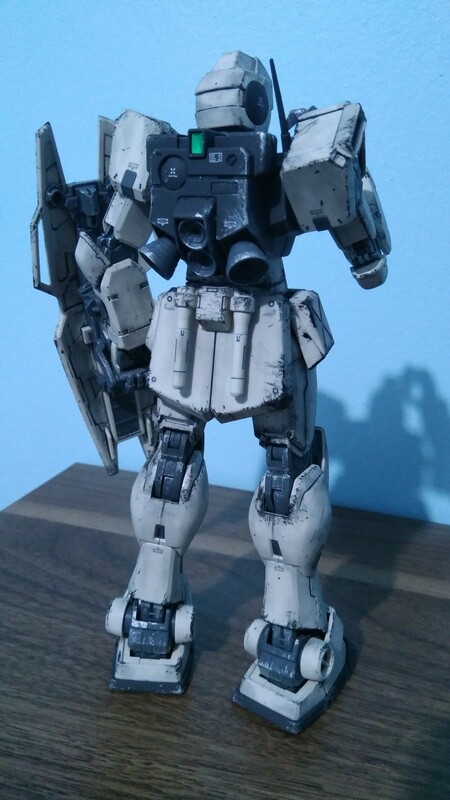 The original plan was to do some light weathering that would match a recon mobile suit and I ended up with a canyon and desert shock trooper. Although I’d like to blame the Tamiya X-1 Black for this, I admit I was being impatient and ended up with a look that I actually really liked. I admit that the weathered kit is far from perfect, but I’d like to think that it’s a decent job for someone’s first weathering job. The added presence from the painting and the matte coat really makes me like this kit even more. 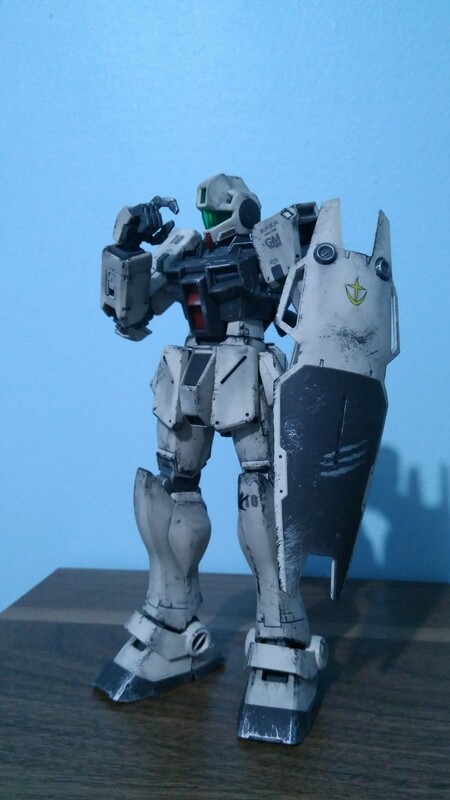 The next thing I have to do is find this guy a partner, which is why I’m also gonna do a weathering project on my recently finished MS-06F Zaku II Space type (review out soon eventually).